Hiding in My Craft Room: HIMCR #204 Winner! Oh my! It is Thursday! Where did Wednesday go?!? So sorry! Let's get on with it and announce our Wednesday Thursday Winner! Steffi and you can see her submission HERE! Congrats Steffi! Please use the 'Contact Me' form to send me the email your want you gift certificate sent to. Thank you all for all the great entries! 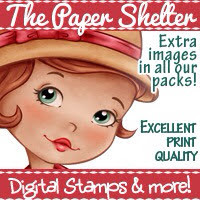 And a BIG thanks to The Paper Shelter for sponsoring our HIMCR challenges! We looooove our sponsors!